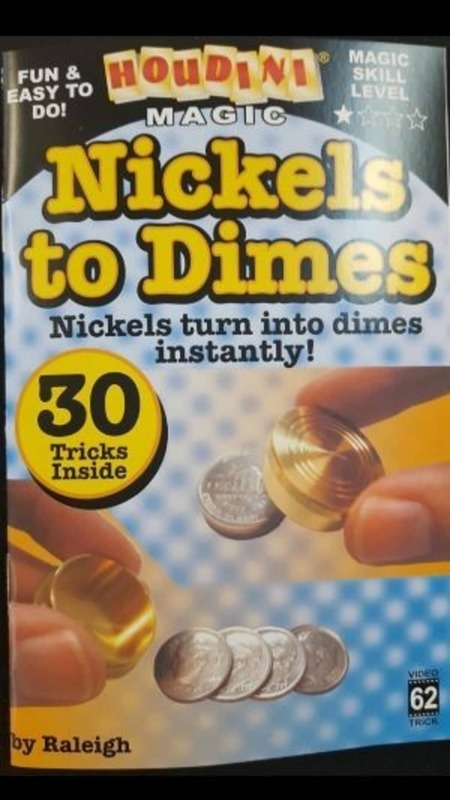 Take four coins the size of an American nickel and do 30 different tricks with them using the magical cap that is included. This is a great trick for young magicians. Basic Nickels to Dimes: Four nickels are shown and covered with a metal cap. When the cap is lifted the four nickels have magically changed into four dimes. Of course, the metal cap is handed out for examination. It contains nothing. The nickels really have vanished! Mathew Munari's Human Slot Machine: Four nickels are shown and placed on top of the performer's head and covered with a small metal cap. The spectators are told that you are a human slot machine. The spectator is asked to pull the handle on the slot machine (your ear) and two dimes are spit from the performer's mouth. Now that's a trick! Also, don't forget to say Jackpot! Raleigh's Dime, Penny, Nickels: Four nickels are shown and covered with the cap. The magician then shows a dime and penny and with a rubbing motion of the hand, the dime vanishes leaving the penny behind. The cap is left, revealing the penny behind. The cap is left revealing the dime, the magician then reaches into his pocket, which was shown empty beforehand, and removes the four nickels. Okito Nickels: Four nickels are shown in the right hand. Covered with the cap, the cap containing nickels are now placed tossed into the left hand, then the cap is placed on top of the left hand. Give the cap a tap and the coins penetrate through the hand but as the coins land on the table, the nickels have changed to dimes.